A video shared by the İHA news agency shows two handcuffed men being beaten by police in the Dikili district of İzmir. The video shows police taking two handcuffed men from a police car in a hospital parking lot. One is taken into the hospital, while the other is put on the ground and severely beaten by a group of plainclothes and uniformed police. 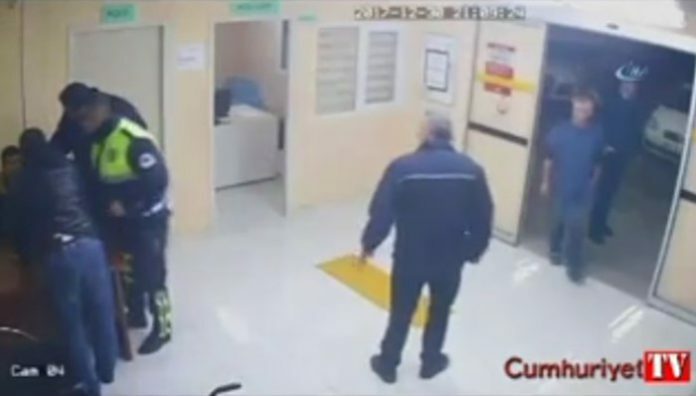 According to the IHA report, police officers later entered the hospital and beat the other handcuffed man. In the meantime officers continue to beat handcuffed man outside and then take him into the hospital. The identity of the two men is not known, but the video recording shows the incident occurred on Dec. 30, 2017.